I dont suppose there were any trailers there? Like rear load lowboys or single drops? Id really like to fine one for my KW's to haul my old tractors. "Give a kid a truck, he''ll want another. Then another, and another........."
I called the ole boy, Did not answer or return my call. Good call. Nice lookin' old Freightshaker. By the way: If you're the fellow that owns the yellow/white '65 Freightliner w/Cummins (with a back drop manifold) that's on Youtube... great old truck. I have really enjoyed the videos of it posted by Hotrodx199. 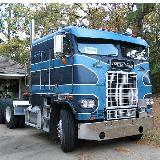 1983 Freightliner COE; Dbl bunk, 3406A Cat, 13 Speed. "What about that Sterling that appears to be sitting in the back? Not keeping that from your buddies are you?" What about that Sterling that appears to be sitting in the back? Not keeping that from your buddies are you? Green Lights and Dry Roads! A little far away but I would like to have the radiator crown top piece off that blue pete hood seting on the back of the yellow freightliner. Lookes like the vandals hit that yard pretty good. Neet thing about west coast trucks, all of those trucks have budd wheels. I would like the headlight bezels off of that Emeryville. Maybe the stainless trim around radiator,but looks broke on passenger's side. Pat, any pics of the yellow truck in the background behind the 2 IH's ? Execution: 0.218. 16 queries. Compression Enabled.